Americares emergency teams are responding to major storms in the United States and the Philippines. 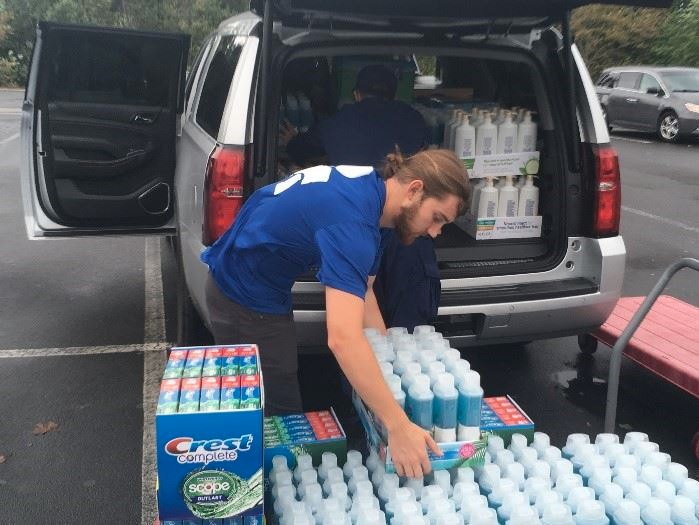 The response team was in Raleigh Saturday morning packing a shipment of hygiene products including toothpaste, soap, shampoo and adult diapers for a medical shelter in Clayton, NC. A shipment of 1,400 first aid kits and 800 hygiene kits left Americares distribution center in Stamford early Saturday morning, destined for North Carolina. Photo by Tom Cotter for Americares. Americares relief workers in Raleigh, North Carolina, prepare a shipment of hygiene supplies for a medical shelter housing storm evacuees on Saturday, Sept. 15. The health-focused relief and development organization has offered assistance to more than 90 partner health clinics in North Carolina, South Carolina and Virginia. Americares is prepared to help health facilities serving low-income and uninsured patients repair storm damage and replace damaged medicine and supplies. Where Typhoon Mangkhut made landfall in northern Luzon early Saturday killing 14 people and forcing tens of thousands to flee their homes, Americares dispatched a medical team to impacted areas. Relief workers left the Americares office in Manila on Saturday headed to Cagayan with hygiene kits, cleaning supplies and medical supplies. The team expected to begin providing medical care to survivors as soon as Sunday. The organization has a long history of responding to emergencies in the U.S., including hurricanes Sandy, Harvey, Irma and Maria and the 2018 California wildfires.